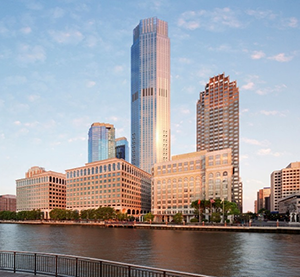 It’s slated to be the tallest NJ tower in history, with 700+ lavish condos–all designed with the healthy indoor air quality of the residents in mind, thanks to American Aldes ventilation products. A 79-story condo tower, called 99 Hudson, is underway in Jersey City that will soar nearly 900 feet into the sky with views of New York Harbor and the Statue of Liberty. When completed, this multifamily skyscraper will feature over 700 Zone Register Terminals (ZRTs) and 1,000 Constant Airflow Regulators (CARs) from American Aldes, to help maintain healthy indoor air quality and lower utility costs. These condos come with added safety assurances, too, because they’ll feature Aldes ZRTs, and CARs with fire dampers, which are the only ETL Safety Certified assembled ventilation units on the market today! Aldes ZRTs & CARs are the preferred ventilation products for multifamily dwellings because they provide automatic on-demand and continuous healthy ventilation that delivers both energy and cost saving benefits, while creating a healthier indoor air quality environment. Partnering again with ADE Systems to secure the sale of ventilation products for the 99 Hudson project, Aldes ZRTs offers flexibility and dynamic control to central exhaust and supply ventilation systems; while Aldes CARs reduce energy usage by automatically regulating airflow in duct systems to constant rates. When finished, the luxurious Hudson tower will house 781 apartments, retail shops, parking spots and amenities including a spa, fitness center, a poker room, a golf simulator, an outdoor pool, playground, cabanas, fire pits, barbeques, and more. From studio size, up to three-bedroom condos will be sold, with one-bedroom units starting at $889,000 and two-bedrooms, priced from $1.5 million. Construction of the magnificent tower is expected to be completed in 2019. Aldes ZRTs and CARs have been installed in thousands of apartments, condos, and other multifamily buildings across the United States and beyond. To see other projects where Aldes products have recently been installed, please visit our Featured Projects Map.